Chick-Fil-A does lots of fun events and on 7/13 they are celebrating “Cow Appreciation Day” by giving away free food to customers dressed like cows! 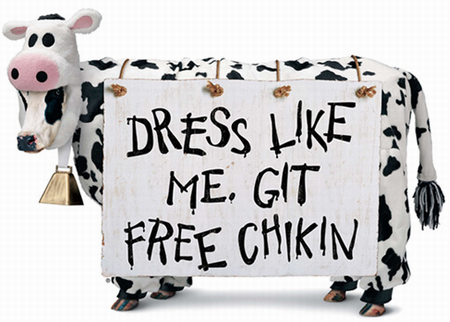 If you wear just a cow accessory, you’ll receive a free entree. Full cow attire entitles you to a free meal. Chick-Fil-A also has “Cow Starter Kits” that will help you to make your own accessory or full cow costume.